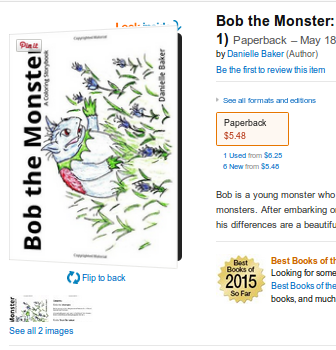 Coloring Page World: Bob the Monster on Amazon! I finally publish my Bob the Monster coloring storybooks in paperback to Amazon.com. They are still available for free on this website and at my writing blog, but it's nice to be able to have both stories in a finished book to add to your storybook collection. Also, the print edition is slightly different and has been edited more.